Çalışmanın amacı doğrudan yabancı yatırımlar, ihracat ve ekonomik büyüme arasındaki ilişkiyi analiz etmek; seçilmiş 44 gelişmekte olan ülkeden kanıtlar ortaya koymaktır. Öncelikle, 2000-2014 dönemine ait yıllık verilerden oluşan veri setleri LLC, IPS ve Hadri panel birim kök testlerine tabi tutulmuş ve serilerin düzey değerlerinde birim kök içermedikleri sonucuna ulaşılmıştır. Seriler arasındaki nedensellik ilişki ise Dumitrescu ve Hurlin Panel Nedensellik Testi yöntemiyle tespit edilmiştir. Elde edilen sonuçlara göre, söz konusu gelişmekte olan ülkelerde doğrudan yabancı yatırımlar, ihracat ve ekonomik büyüme değişkenleri arasında çift yönlü nedensellik ilişkisinin varlığından söz edilebilir şeklindedir. The purpose of this study is to analyze the relationship among foreign direct investments, export and economic growth, and to provide evidence from 44 selected developing countries. Firstly, the data sets consisting of annual data in the period of 2000-2014 were subjected to LLC, IPS and Hadri panel unit root tests and it was concluded that the series did not have unit roots in their level values. The causality relationship among the series was determined using the Dumitrescu-Hurlin Causality Test method. According to the results obtained, it may be argued that there is a two-way relationship of causality among the variables foreign direct investments, export and economic growth in the developing countries in question. Ahmad, J. and Kwan, A. C. (1991). Causality Between Exports And Economic Growth: Empirical Evidence From Africa. Economics Letters, 37 (3), 243-248. Ahmad, J. and Harnhirun S., (1996). Cointegration and Causality Between Exports and Economic Growth: Evidence from the ASEAN Countries. The Canadian Journal of Economics, 29 (2), 413-416. Alfaro, L., Chanda, A., Kalemli, S. and Özcan, S. (2004). FDI and Economic Growth, The Role of Local Financial Markets. Journal of International Economics, 64, 113-134. Aydemir, C. Arslan İ. and Uncu F. (2012). Development of Foreign Direct Investments: Turkey and the World. Kocaeli University Journal of Social Sciences, 23, 69-104. Baltagi, Badi H. (2005). Econometric Analysis of Panel Data. Third Edition, John Wiley&Sons Ltd., England. Berthelemy, Jean-C., Demurger, S. (2000). Foreign Direct Investment and Economic Growth: Theory and Application to China. Review of Development Economics, 4(2), 140-155. Bozkurt, H. and Dursun G. (2006). The Interaction Between Investment in Information and Communication Technology and Flows Foreign Direct Investment: Co-Integration Analysis for Turkey, 1980-2004. Journal of Knowledge Economy & Knowledge Management, Vol: I-I, I-II (Special Issue), 37-49. Campos, Nauro F., and Kinoshita Y. (2002). Foreign Direct Investment as Technology Transferred: Some Panel Evidence from the Transition Countries. The Manchester School, 70 (3), 398-419. Cengiz A. (2009). Causality Analysis between Exports, Imports and Economic Growth of Turkey’’ Kocaeli University Journal of Social Sciences, 18 (2), 35–47. Choe, J. I. (2003). Do Foreign Direct Investment and Gross Domestic Investment Promote Economic Growth?. Review of Development Economics, 7(1), 44-57. Choong, C.K., A.Z. Baharumshah, Z. Yusop and M.S. Habibullah (2010). Private Capital Flows, Stock Markets and Economic Growth in Developed and Developing Countries: A Comparative Analysis. Japan and the World Economy, 22, 107‐117. Chowdhury, A.and G. Mavrotas (2005). FDI and Growth: A Causal Relationship. United Nation University, WİDER, Research Paper No: 2005/25. Değer, K. (2006). Tourism and Export Oriented Growth:1980-2005 Turkey Experiment. Atatürk University Journal of Economics and Administrative Sciences, 20 (2), 67-86. Dumitrescu, E. I. and Hurlin, C., (2012). Testing for Granger Noncausality in Heterogeneous Panels. Economic Modelling, 29(4), 1450-1460. Dunning, J.H. (1994). “Re-evaluating The Benefits Offoreign Direct Investment”, Transnational Corporations. 3(1), 23–51. Ekanayake, E. M. (1999). Exports and Economic Growth in Asian Developing Countries: Cointegration and Error-Correction Models. Journal of Economic Development, 24 (2), 43-56. Erçakar, M. E. and Karagöl (2011). Foreign Direct Investments in Turkey. SETA Analiz, 33, 1-32. Erdoğan, S. (2006). Relation of Change and Growth in Exports Structure of Turkey: Cointegration and Causality Test Application. 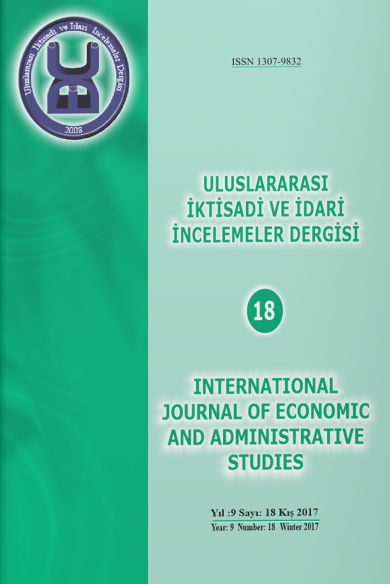 Selçuk University Karaman Journal of Economics and Administrative Sciences Dergisi, 10, 30-39. Gedikli, A. (2011). The Effects of Multinational Corporations and Foreign Direct Investments on The Recovery of Developing Countries. Journal of Entrepreneurship and Development, 6(1), 96-146. Genç, M. C., Değer M. K. and Berber, M. (2010). Human Capital, Export and Economic Growth: Analysis of Causality for Turkish Economy. The Journal of Knowledge Economy & Knowledge Management, 5 (1), 29-41. Göçer İ., Bulut S. and Dam M. M. (2012). The Effects of Foreign Direct Investments on Export Performance of Turkey: An Econometric Analysis. Business and Economics Research Journal, 3 (2), 21-40. Hadri, K. (2000). Testing for Stationary in Heterogeneous Panel Data. Econometric Journal, (3), 148-161. IM, K. S., Pesaran, M. H. ve Shin, Y. (2003). Testing for Unit Roots in Heterogeneous Panels. Journal of Econometrics, 115(1), 53–74. Göçer, İ., Kutbay, H., Gerede, C. and Aslan, R. (2014). Effects of Tax Incentives on R&D and Innovation: Panel Cointegration and Causality Analysis. Maliye Dergisi, 167, 163-183. Kar, M. and Tatlıöz F. (2008). Econometric Analysis of Determinants of Foreign Direct Investment in Turkey. Karamanoglu Mehmetbey University, Journal of Economics and Administrative Sciences, 10(14). Karluk, R. (2002). International Economics Theory and Application, Beta Publishig, No: 1249, İstanbul. Lensink, R. and Morrısey, O. (2001). Foreign Direct Investment, Flows, Volatility and Economic Growth in Developing Countries. Paper presented at DESG Conference University of Nottingham, Nothingham. Levin, A., C. Lin, ve J.C. Chia-Shang (2002). Unit Root Tests in Panel Data: Asymptotic and Finite-Sample Properties. Journal of Econometrics, 108, 1–24. Okuyan, H. A. and Erbaykal E. (2008). The Relationship Between FDI and Economic Growth in Developing Countries. Economic Approach, 19(67), 47-58. Özcan, B. and Arı A. (2010). An Analysis on the Determinants of Foreign Direct Investments: Example for OECD. İstanbul University, Faculty of Economics, Econometrics and Statistics Journal, 12,65-88. Özel, H. A. (2012). Theoretical Grounds of Economic Growth. Çankırı Karatekin University, Journal of the Faculty of Economics & Administrative Sciences, 2 (1), 63-72. Razin, A. (2002). FDI Contribution to Capital Flows and Investment in Capacity. National Bureau of Economic Research, Working Paper, No: 9204. Sandalcılar A.R. and Altiner A. (2012). Foreign Direct Investment and Gross Domestic Product: An Application on ECO Region (1995-2011). International Journal of Business and Social Science 3(22), 189-198. Sandalcılar, A. R. (2012). Relationship Between Export and Economic Growth in the BRIC Countries: Panel Cointegration and Panel Causality. Suleyman Demirel University The Journal of Faculty of Economics and Administrative Sciences, 17 (1), 161-179. The Eighth Five-Year Development Plan (2001-2005). Reports of The Specialization Commission on Foreign Direct Investment, Publ. No: DPT:2514-ÖİK:532, Ankara. Şimşek, M. (2003). Analysis of Export Oriented Growth Hypothesis with The Data of Turkish Economy, 1960-2002. Dokuz Eylül University, Faculty of Economics and Administrative Sciences Journal, 18(2), 43- 63. Tandırcıoğlu, H. and Özen, A. (2003). The Foreign Direct Capital Investment in Transition Economies. Dokuz Eylül University, The Journal of Graduate School of Social Sciences, 5(4), 105-129. Yang, B. (2008). FDI and Growth: A Varying Relationship across Regions and Over Time. Applied Economics Letters, 15, 105-108. Yapraklı, S. (2007). Causality Between Exports and Economic Growth: An Econometric Analysis on Turkey. METU Studies in Development, 34 (1), 97-112. Yılmazer, M. (2010). Relationship with Foreign Direct Investment, Foreign Trade and Economic Growth: A Case Study on Turkey. Celal Bayar University The Journal of Social Sciences, 8 (1), 241-260. Zhang, K. H. (2001). Does Foreign Direct Investment Promote Economic Growth? Evidence from East Asia and Latin America. Contemporary Economic Policy, 19(2), 175- 185.